The Bad Kitty Bakery: The Muffin Addict and Oat Bran Muffins with a Recipe! 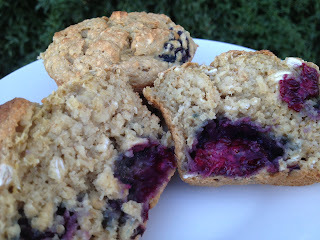 The Muffin Addict and Oat Bran Muffins with a Recipe! I created a monster. It happened one early Saturday when my friend Suzzi and I were out hitting yard sales and suddenly, we were both hungry! Luckily we were right by Trader Joes so I stopped by to get bran muffins. These were dense, bran-rific, and slightly sweet. I had them before, but after one bite, Suzzi was addicted. She passed that addiction onto her boyfriend Geoff, but that addiction comes with a hefty price tag. Seriously, those things are not cheap. Therefore, she said that since I created her madness, I come up with a version she could make. I did. And I promised her the recipe in a blog. And then my life became insane. Well, here it is. These bran muffins are not exactly like they are at Trader Joes, but they are awesome and tasty. They are also a lot less expensive. You’ll also notice that these are oat bran based. These are gluten free, and you can vary the berries. In a cup, combine the vegan milk and apple cider vinegar. In a bowl, combine the oat bran, rolled oats, corn starch, gluten free baking mix, xantham gum, baking powder, baking soda, and salt. Stir until combined. Add the fruit and toss gently in the flour. Add the vegan milk mixture and apple sauce. Spoon into muffin tins, filling each paper about 3/4ths full. Bake 20 minutes, cool, and enjoy. Seitan Dumpling Stew with RECIPE!